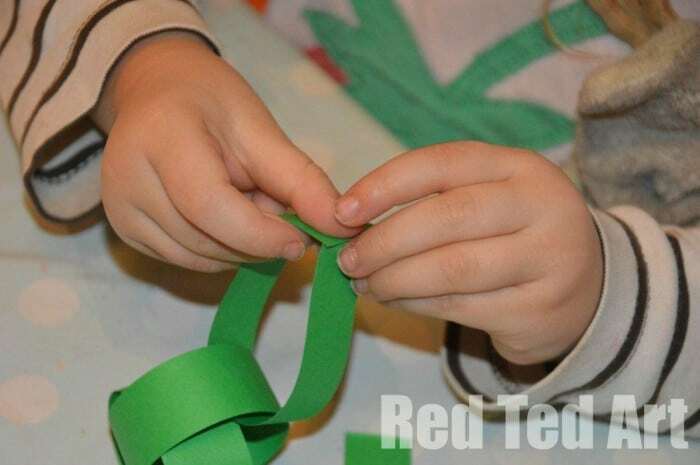 Just before Christmas Pip Squeak discovered her love for Paper Chains! We were visiting a friend who has some fabulously shiny, pre cut and with a self adhesive! Perfect for small toddler hands. 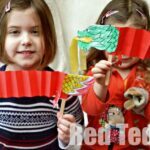 So we made a fun chain… and with Chinese New Year approaching, I thought another simple snake craft for kids would be great – so we made some paper chain snakes (we have some more Chinese New Year’s Crafts for you to explore, do take a peak!). It took us 10min or so, with very little set up time but a very happy Pip Squeak at the end. 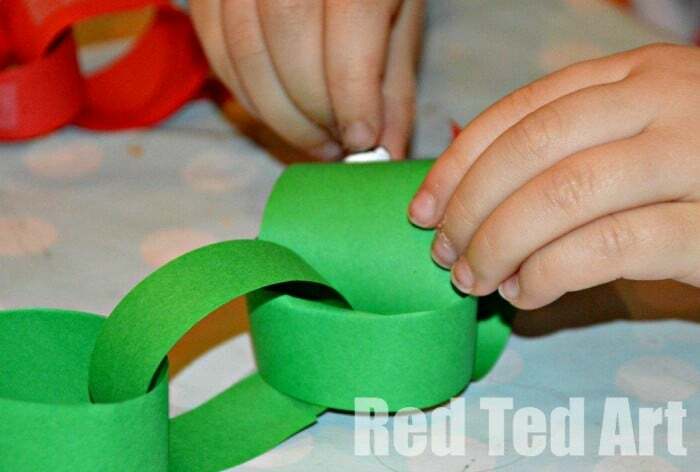 I think I will offer to do these with Red Ted’s class once school starts again. 1) I cut strips out for Pip Squeak (3yrs). She threaded them through each other, then I held the loop for her, passed her some tape and she taped them all shut. I used tape, as I thought it would be easier for Pip Squeak to manage. I think with slightly older kids I would use the glue stick. I am not sure she could make this totally by herself, but I was impressed at how much better she was getting at inserting, turning and adding the tape. 2) For the head I cut strip twice as wide. Then we glued on googly eyes and taped on a red tongue. And done! 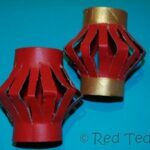 Such a quick and easy Chinese New Year craft! Very cute. 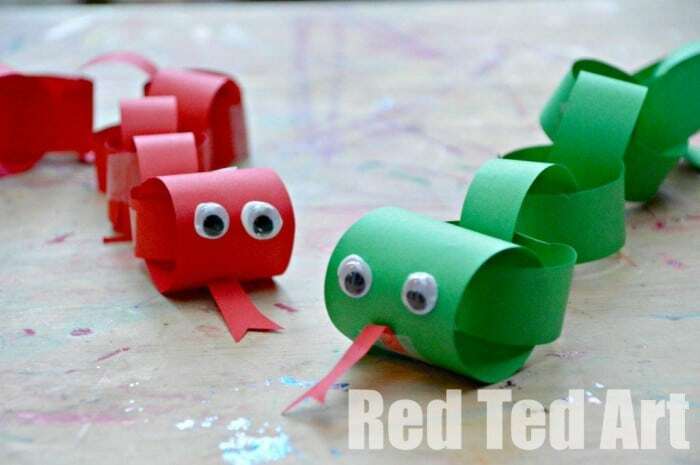 Of course you can make snakes at any time of year.. 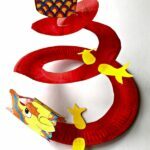 They would be great for practicing your S letter – especially as you can nicely make the shape “S” with your snake. Cute! 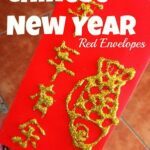 I can’t believe it will be Chinese NEw Year in a month’s time. I’m just recovering from Christmas!! I know, it really catches up with you! Happy Crafting Days to you too! 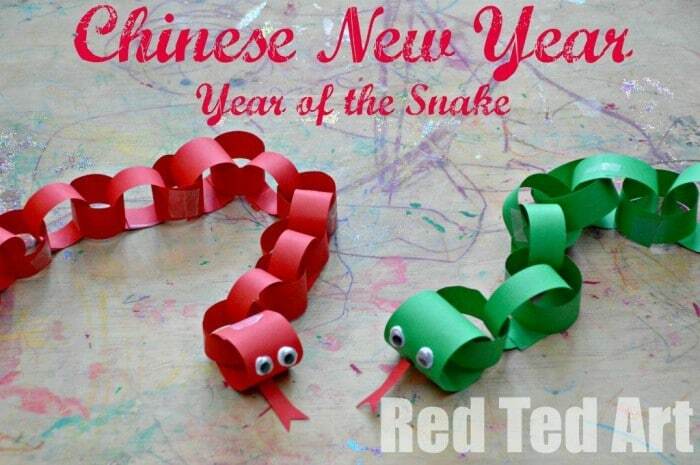 What a fun craft for the year of the snake! Happy New Year to you!! 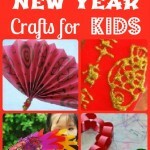 What a great craft for Chinese New Year! 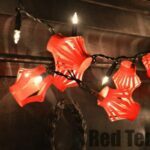 I’m tired of the red lantern and this is very similar in terms of level of difficulty and materials! Thank you! They are fab! We will certainly be trying those very soon. 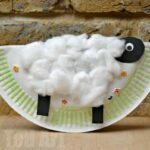 As always, adorable and SO perfect for little hands! 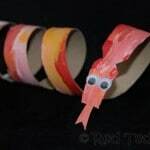 Paper snakes look great. I remember making paper figures at school.